I love reading. I always have. It is a wonderful gift that so many miss out on due to circumstances beyond their control, be they financial, physical or geographical. As a child it was my way of disappearing into adventures, friendships and experiences where my imagination could run wild. Have you ever had the feeling when putting down a really good book that you miss the characters? I have. You’re sad to no longer share in their lives? That’s when you know it’s been a really good story. There is a gift to story telling. I marvel how, using words we all know, someone can capture one’s attention so vividly. Thankfully, either through genetics or by design (my son has grown up surrounded by books), he now loves to read. We often curl up on the couch or bed and snuggle together discovering new characters and adventures in amongst the pages. We recently had a clear out of all his books that are no longer age appropriate and it was sad to see some of them go, but they had served their purpose and have moved on to entertain other young families. One thing I won’t tolerate, is disrespecting a book. Books are to be cherished and looked after. He’s been taught that from a young age. I love it when he quietly selects books out of the bookshelf and sits reading to himself too – we encourage this but are careful to not over-emphasise it. Every birthday and Christmas he gets at least one book for his collection. We try to order books quarterly through the school’s Scholastic Books programme as it is a way of continuing his love of reading, but also supporting the school financially. But my favourite place to order books is from http://www.bookdepository.co.uk. They have free worldwide shipping and books range from cheaper paper backs to the more expensive hard backs. They are cheaper than any I can find in New Zealand and are generally shipped within a couple of days if in stock and it’s always exciting when the new books arrive. Although sometimes it’s a little difficult to receive and hide them away if they are gifts. Books make fantastic gifts too. Never throw out your old books, unless completely moth-eaten or destroyed. Schools, clubs, 2nd hand shops are often willing and grateful to accept donations. Books can be expensive, especially when families are struggling to clothe and feed themselves, but a visit to the local library is free and there is always a wealth of knowledge and selection on offer. We often visit our local library and leave loaded up with armfuls of books. He even asks to go to the library if we haven’t been in a while and proudly checks the books out himself. 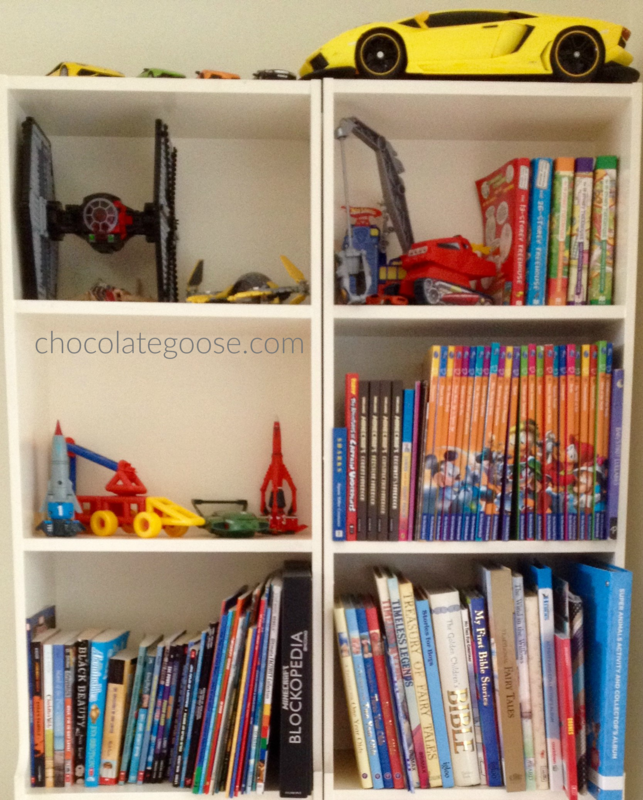 This new section of ChocolateGoose is simply to share books that I’ve enjoyed either on my own, or with him and hopefully might help others to foster a love of reading. I’d love to hear your suggestions too about books you’ve discovered and enjoyed. Jacqueline Kennedy was once quoted as saying: There are many little ways to enlarge your child’s world – Love of books is the best of all. You can find this new section on the main Menu.